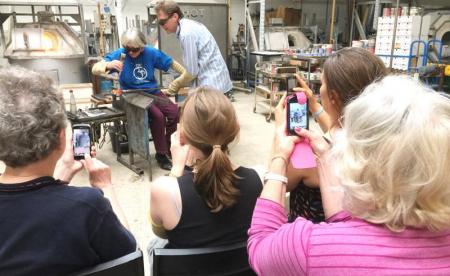 If you are looking for a unique and creative gift for a special person, why not give a voucher for our Glassblowing Short Taster Course? You can personalise the voucher with the name of the recipient, as well as any short personal message you might like to add. You can add your message during the purchase process in the box marked “Add Note”, or simply email us once your purchase is completed. Gift vouchers are valid for one year from purchase and will be emailed to you on purchase. Each gift voucher will include a unique code, which enables the recipient to select a date convenient to themselves and book their course using our online course booking calendar. Uniquely, we offer you the chance to accompany your loved one or friend to our studio to watch, take photos and enjoy the course experience with them. The voucher is valid for one year from date of purchase. Most voucher recipients are keen to book up and take their course as soon as possible, but if we have not received a booking by the end of the first six months, we will send you a reminder via email. A further email reminder will be sent one month before the voucher is due to expire. 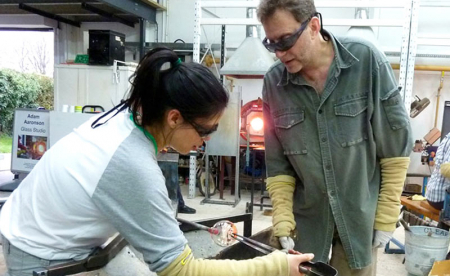 Experience the magic of glassblowing with a Glassblowing Short Taster Course Gift Voucher. 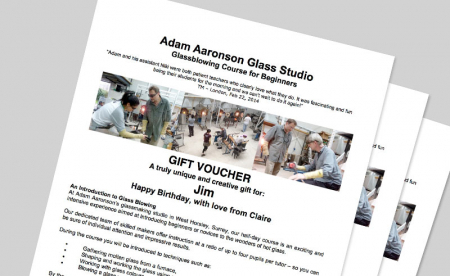 A unique and creative gift for a special person, this voucher is for our Glassblowing Short Taster Course. Gift vouchers are valid for one year from purchase. Each gift voucher will include a unique code. Our website will automatically email the voucher code to you on purchase. You can also personalise the voucher with the name of the recipient. You can do this by adding your message when you book. Or you can let us know your short personal message by email. Once we have your message, we will prepare the voucher and email it to you. The recipient can then select a date convenient to themselves and book their course using our online course booking calendar. Uniquely, we offer you the chance to accompany your loved one or friend to our studio to watch. Do come along and take photos and enjoy the course experience with them.